Everybody involved in the discussion of the Supreme Court's decision in Morse vs. Frederick seems to think that the only mean of "bong" is "a kind of water-pipe used especially for smoking marijuana". Actually, there is another meaning, which I at least learned first. 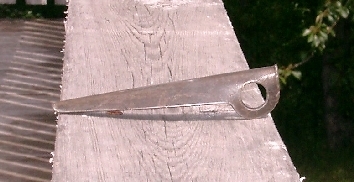 A "bong" is a very wide piton. Some of our readers no doubt don't know what a piton is. 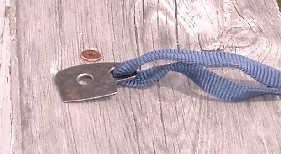 A piton is a kind of metal spike used by rock climbers. You hammer it into a crack and use it as an anchor for belaying (catching falls), direct aid (climbing by means of stirrups attached to anchors when the holds are insufficient for free climbing), or to hold the rope when descending. When I learned to climb pitons were the primary type of anchor. Nowadays, they have largely but not entirely been replaced by other devices. The word is a loan from French piton, but in English it is pronounced [pʰijtan]. Here is an ordinary piton. 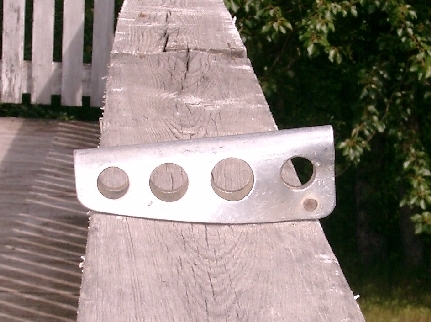 It is a Chouinard 1/4 inch angle piton, a classic that we might regard as the perfect example. Here is a bong. This is a fairly small bong. At the opposite extreme is the RURP, which stands for "Realized Ultimate Reality Piton". A RURP will only fit into cracks whose existence is on the borderline between real and imaginary. To place a RURP, the climber imagines a crack and gently inserts the RURP into it. I once put all my body weight on a RURP inserted into the underside of an overhang. I was lighter then.